One of the biggest wastes of our money is tossing out food we don’t eat. We buy fresh foods and let them go bad in our fridges. We clean out our pantries and cupboards and toss everything that has passed its expiration date. But do we were really need to toss ALL that food?. Just what do the dates on our food really mean? It turns out that the expiration dates on your food don’t really mean much to you as a consumer. They have more to do with the need to move merchandise off store shelves and trick shoppers into believing they are getting “fresh” foods, than they do with food safety. When you see the words “Use By” or “Freeze By” on packaged foods, that is an indication that the food should be consumed or frozen by that date in order to ensure it is still safe to eat and tastes good. A “Sell By” date means that is the latest it should be on store shelves. You can buy something on the “Sell By” date and as long as you eat or freeze it within the week, it should be fine. When you see the words “Best By” before the date on food items, it means that the item will taste the best if it’s eaten by that date. It’s probably still safe to eat weeks or even months later. With so much similar terminology, it is easy to see why we’re so quick to toss out perfectly good food. It’s confusing, and no one wants to get food poisoning. But we’re wasting a ton of resources to produce that food, and we’re wasting a ton of money. In fact, Americans waste more than $165 billion in food each year. Now, even though I’m a cheapskate, I’m not going to tell you to eat anything that you don’t believe is safe to eat. I’m not going to tell you to slice the mold off the cheese or skim the lumps off the milk or anything like that. But I am going to suggest that you take those expiration dates on food packaging with a grain of salt. Use some common sense. So the Italian salad dressing with the “Best By” date of a month ago is still in the fridge. The ingredients are pretty shelf stable stuff – vinegar, vegetable oil, spices and water. It’s probably still safe to eat it. Eggs can be used a month past their sell by date, and you can always do a check to see if your eggs are fresh to know for sure. Crackers may not taste as fresh, but they won’t cause any harm, particularly if they’re crushed up on top of a yummy casserole. Look at your food, smell your food, taste a tiny bit of it. You can even use a resource like Still Tasty. And then, if you are going to eat it, make a point to do so as soon as possible. 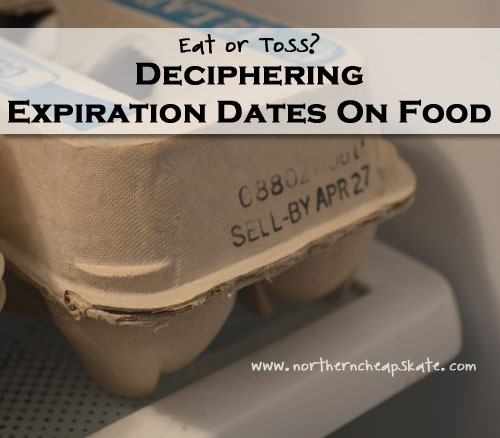 Another way to avoid trying to figure out those expiration dates is to reduce the amount of food you purchase with expiration dates. Buy (or grow!) fresh fruits and vegetables. Catch your own fish. Bake your own breads and treats. The more connected you are to where your food comes from, the more educated decisions you can make about whether you should eat it or toss it. If you find that you’re tossing out a lot of food that’s gone bad, there’s usually a good explanation. You could be buying things because you think you should buy them, not because you really like them (the-old-“I-bought-veggies-because-I’m-healthy-but-I’ll-order-a-pizza-tonight”-syndrome). Perhaps you are buying too much of a particular item and it’s going bad before you can finish it. With a little better menu planning, you can plan meals for your family using things you already have on hand. Eat more, toss less. Enjoy the savings!